Run the engine for five minutes in a well ventilated area – this will help warm the engine oil to let it drain faster and more completely. Always inspect o-rings for damage and replace if needed. 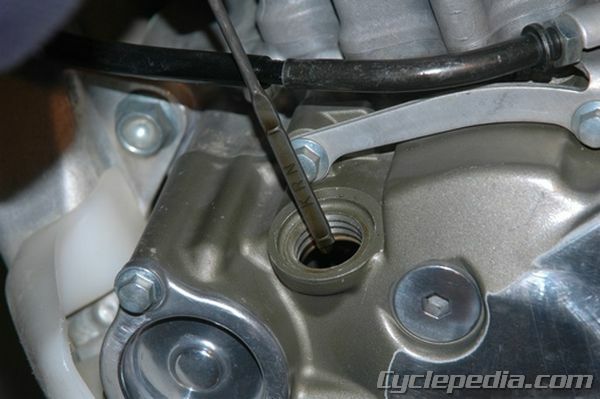 Place an oil drain pan under the engine and remove the drain bolt and sealing washer. Discard the sealing washer. 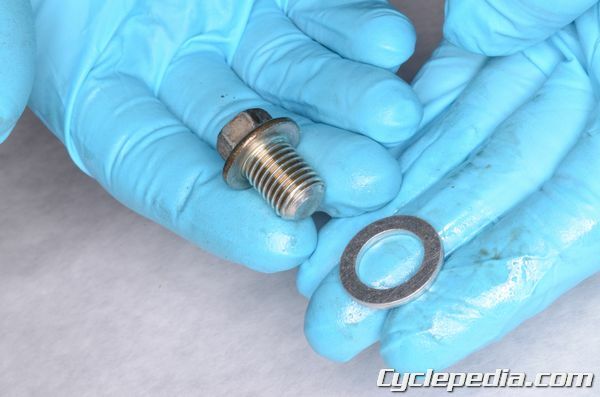 Install the oil drain plug with a new sealing washer and torque it to specification. Check your Service Manual for the torque specification. There are two types of oil filters currently being used. The paper cartridge type above are common in off road bikes and various ATVs and dual sport bikes. Most cartridge filters are held in by a spring on the inside of the filter chamber cap. 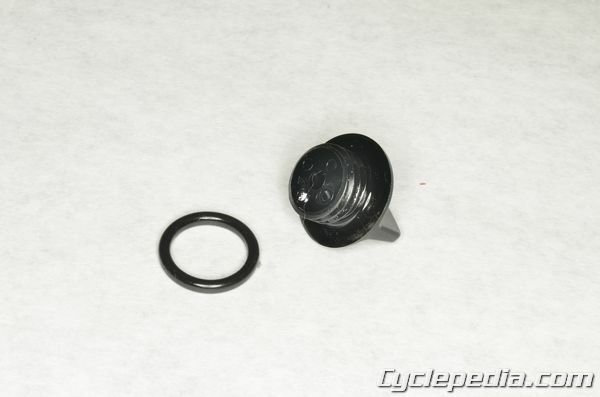 Make sure to keep track of this spring during disassembly, and install it with the cap on reassembly. 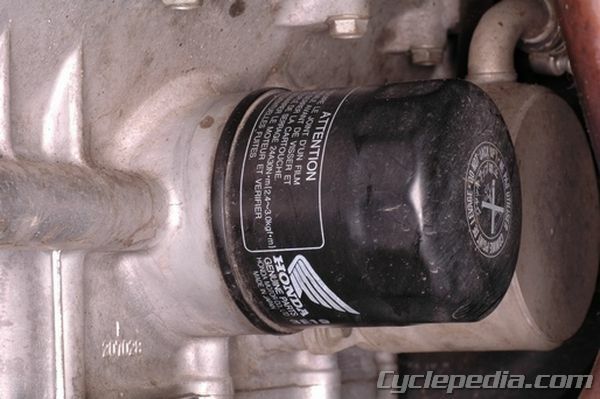 The spin-on type of filter is identical to typical automotive filters, and they are used on many street bikes and ATVs. 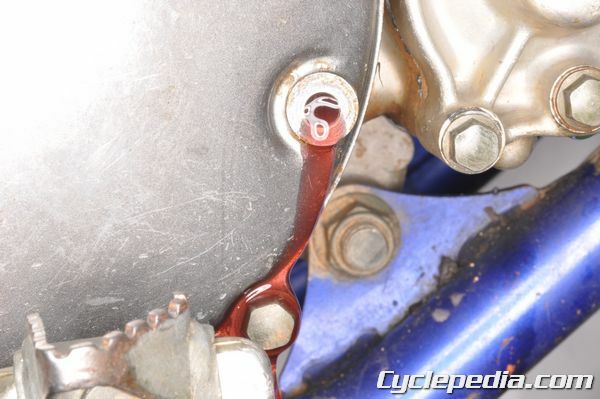 Place the oil drain pan under the oil filter when you remove it. 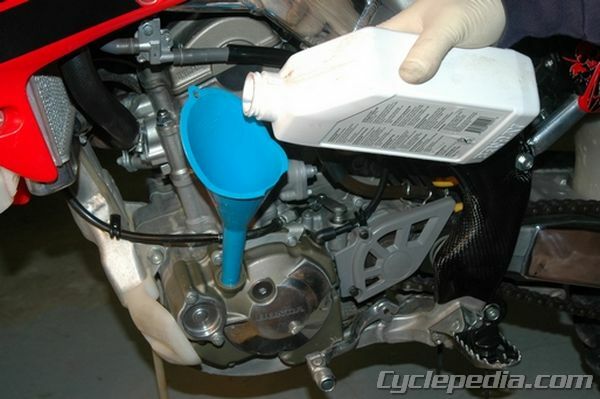 Before installing either type of oil filter, it’s a good idea to saturate it with clean engine oil. This will prevent possible engine damage due to oil starvation that might occur when you first start the engine and the oil pump is saturating the oil filter instead of lubricating the engine. 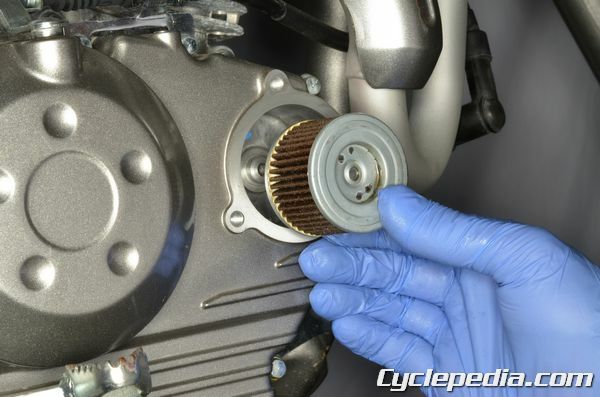 Before installing a spin on oil filter, apply a film of engine oil to the rubber O-ring to prevent it from possibly tearing when tightening the filter. 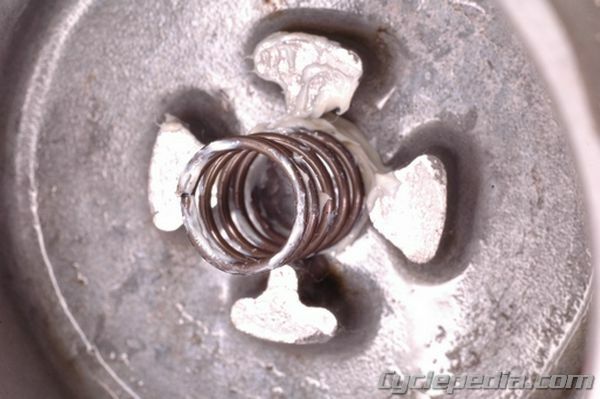 Spin on oil filters should be tightened hand tight or torqued to specification if there is one in your Service Manual. A few smaller machines use no cartridge-type or spin-on filter, and rely instead on a cleanable screen filter. Some screen filters are easily accessible from the outside of the cases, and others are only made to be serviced when the case cover is removed. Some KTM machines have more than one screen-type filter as well as a cartridge filter, and some have two cartridge filters and two screen filters! 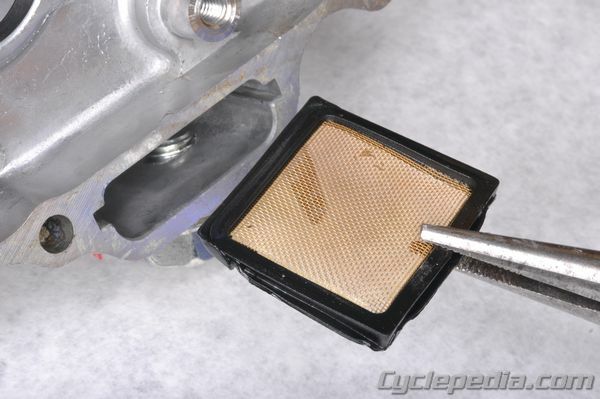 Check your Cyclepedia service manual for the filter configuration on your bike, and don’t miss any of the oil filters. 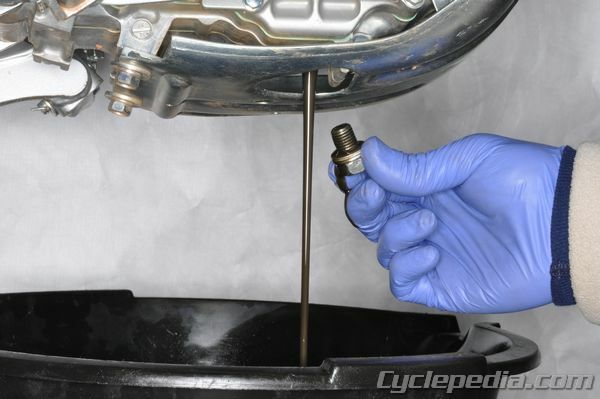 Pour the recommended amount and type of engine oil into the oil filler opening. Start the machine and let idle for a couple of minutes. There are currently three methods of checking the oil level on a four stroke engine, the dipstick, the oil sight glass and the oil level check bolt. When checking the oil level with a dipstick on most machines, insert the dipstick into the oil filler opening and let it rest on the threads, do not screw it in (check your owners manual for the best procedure for your machine). 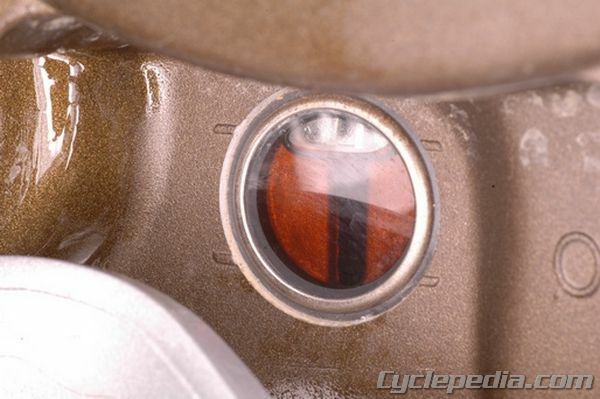 The oil sight glass will have marks indicating the proper oil level. 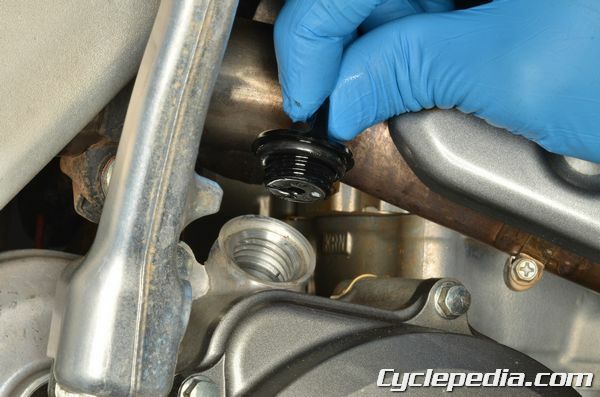 With the oil level check bolt, remove the bolt and its sealing washer (the bolt will usually be a hex head bolt with a Phillips screwdriver compatibility), if oil leaks out the oil level is correct, if it doesn’t, add oil until it does. When checking the oil level with any of the three methods, make sure the motorcycle is completely vertical on level ground. Start the engine and check for any leaks. Locate and repair any leaks before riding the vehicle. Every machine has different procedures and requirements when it comes to check oil levels and changing oil. 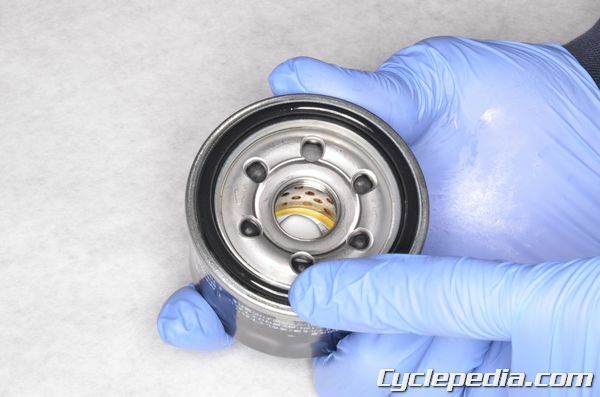 Be sure to check your Cyclepedia manual, or a factory manual, for the proper instructions before servicing your lubrication system.